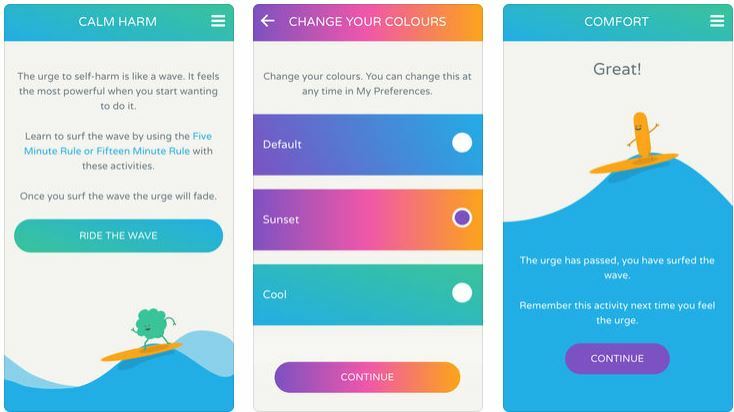 Calm Harm is a mobile app aimed to assist people experiencing self-harm. Based on some principles derived from DBT (Dialectical Behavior Therapy), the program directs the user to “ride the wave” of the urge to self-harm. When the urge rises, the user can choose between 5 or 15 minute blocks of different activities with the purpose of overcoming the urge. The 5 minute blocks include 1 minute activities (e.g. get a red pen and draw where you want to hurt yourself), which, once completed allow to evaluate if the urge passed and if not, to continue to the next activity. The 15 minute blocks include one long activity (e.g. cook something). After selecting an activity, a timer begins and at the end the user is invited to report if they completed the activity, and if they did, this activity is documented in a personal log. Additional features include: view of personal logs, personalize your activities, emergency contact. Simple to use, easy tasks, free. Lacks adaptivity and motivating features. Calm Harm is a simple to use app, mostly recommended as an adjunct to treatment, due to the nature of the condition it’s aiming to address. Its simplicity makes it a practical tool to apply. Activities are simple and realistic, delivered in an attractive design. As part of an ongoing treatment, the app can overcome a lack of adaptiveness and motivating features that could benefit it as a standalone tool. Calm Harm could be recommended for patients who self-harm, and possess a certain amount of energy and motivation that are required to “ride the wave” of the self-harm urge. The app can be used in between sessions as a tool to help overcome the urge to self-harm, while the therapist can assist in reviewing weekly logs and progress, and in motivating towards continuous use.